Mike Ullery | Daily Call Piqua’s 311 Draft House has new owners. Nancy and Tom Elliott, of Shelby County, purchased the business and will be taking the reins this week. PIQUA — 311 Draft House has become, for many, the go-to place in downtown Piqua for dinner, drinks, or both. Gregg and Kathleen Wyatt designed, built, and made 311 “home” for hungry and thirsty Piqua residents over the past five years, but decided that it is time to move on. 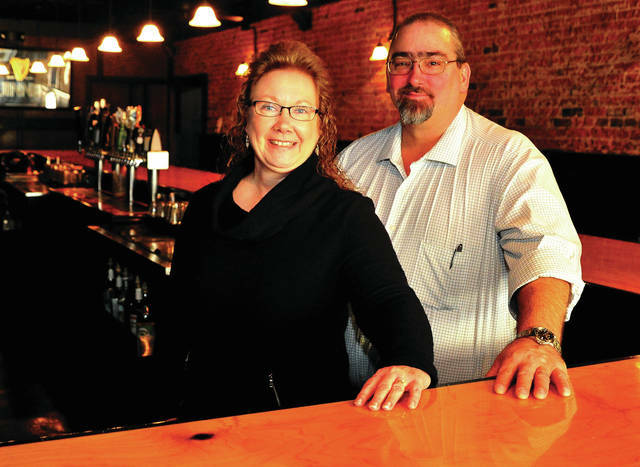 Taking over the the reins of 311 Draft House are Tom and Nancy Elliott of Shelby County. The Wyatts, both veterans of the United States Air Force, with Kathleen still serving, purchased the establishment in 2013 and after extensive renovation, 311 Draft House opened its door in December of that year. When the Wyatts decided that it was time to look into selling the business, they chose a broker, Sunbelt, to handle the deal. Sunbelt, based in Dayton, brokers business purchases and mergers, screening potential buyers. Gregg and Kathleen listed their business with Sunbelt expecting it to be a minimum of several months before any inquiries came. “Sunbelt did a really good job for us,” said Kathleen. “This is a lifelong dream of mine,” continued Elliott, “I’m a closet gourmet.” Elliott’s background is in manufacturing and management. The Wyatts will continue to live in the area, subject eventually to whatever plans the U.S. Air Force has for Kathleen. In the meantime, they will continue to drop in at the family corner bar at 311, where everybody knows your name. https://www.dailycall.com/wp-content/uploads/sites/30/2018/11/web1_110318mju_311Owners-1.jpgMike Ullery | Daily Call Piqua’s 311 Draft House has new owners. Nancy and Tom Elliott, of Shelby County, purchased the business and will be taking the reins this week.